Day Four Done Well – Day Five Digs In. With the drama of day three behind them day four was trouble free, though challenging for Jason and the Rooney team. With sections 9 & 10 completed the team find themselves in Position 30 overall (of motorcycles). 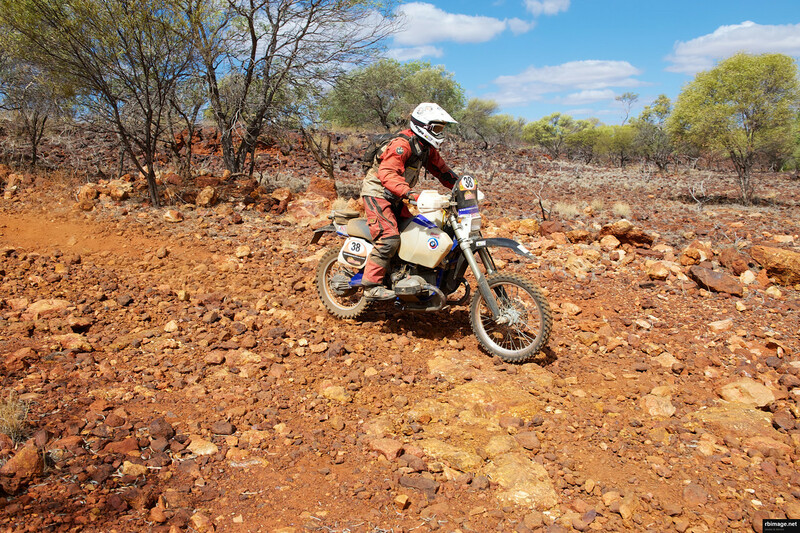 Ross Briggs snapped the picture below of Jason navigating the rocky terrain of Leg 4. The toll on vehicles for the day was high and to make matters worse the leg was ‘unassisted’ (4 bikes suffered mechanical issues in SS9 and were unable to complete). When Paul saw Jason bringing her home he cried “bloody beauty!”, the rocky sections had destroyed the Big BMW’s tyres. Talking to Paul you can hear the dry dust in his voice, behind it though, you can feel the excitement of the rally…GO Team Rooney Go!